MILSROF EGLOS ROAD LUDGVAN CHURCHTOWN CORNWALL ENGLAND TR208HG NO FEE IS PAYABLE. Crisis is concerned with the Arts in general, and from a Christian perspective. 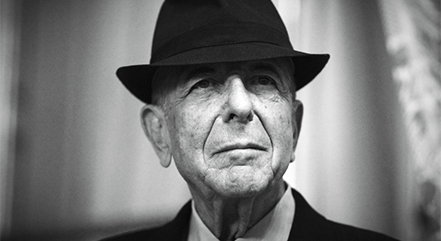 Straight from the first seconds there’s a mean moody feel to the new glorious album from Leonard Cohen. Popular Problems (Columbia). It’s so beautifully arranged. so cool the piano with of course an enchanting rhythm section, frequent delightful violin forays, and gospellish organ outings, plus the now famous Cohen femme back-ups that hover and hover, and are so superb in their own right. There’s less biblical reference here than some of his album lyrics but even as I write track seven “Nevermind” takes me into the Old Testament chase for freedom of the Jewish people from Pharaoh. He sings “Blessed is the Name written on my heart.” This is fantastic. Both Leonard Cohen and Lucinda Williams have top rate musicians to give that extra quality lift, and so to it can be said of those playing on the new Marianne Faithfull album Give My Love (Dramatico). She sings Cohen’s ‘Going Home’ on what is her first album in three years. This is another set of life musings, caustic and often angry, and at its rawest on ‘Late Victorian Holocaust’ with its drug theme, and the singer has known well at times the negative life-denying blackness substances can have. Once upon a time Ray Stevens adorned the pop charts and if some might wonder what ever happened to him, here he is back with the Ray Stevens Gospel Collection. (Joining the Dots) The track listing offers the familiar, so we get ‘Swing Low, Sweet Chariot’, ‘ “Shall we Gather at the River’. ‘Amazing Grace,’ even ‘Onward Christian Soldiers’ and his hit of long time back ‘Turn The Radio One.’ I expected somewhat laid-back country, but instead as with ‘the opening track ‘Swing Low’ we get a big, big sound. ‘The Old Rugged Cross’ is anther that after a few moments suddenly assumes the front-foot swagger. You can sing ‘Old Time Religion’ with slowness and assumed reverence, whereas here Stevens rides his motor-bike singing version at 120 m.p.h. Things only assume a somewhat hymn-like air when we move into an initial acappella take of ‘Onward Christian Soldiers’ before it dramatically changes, gone the church bell, instead a fiery orchestra and Stevens obviously wishing to lose weight as it becomes a fast moving stomper of a cut. ‘Amazing Grace’ is another familiar song given a working-over. Here there’s dramatic musical backing, and indeed as with other arrangements, it seems as though someone has thought of building a show around much loved hymns. It’s album 16 for Simple Minds. Big Music is exactly what it says – full of great pop that surges away and needs to be heard on some powerful speakers and plenty of room space. It’s frequently over the top, so much so that at times you do not hear the lyrics, just a pounding beat that drowns the vocal.. Huge synth lines come rearing their head and it has an 80s feel ,but if somewhat paradoxically it’s still with a contemporary edge, Yea, like it! 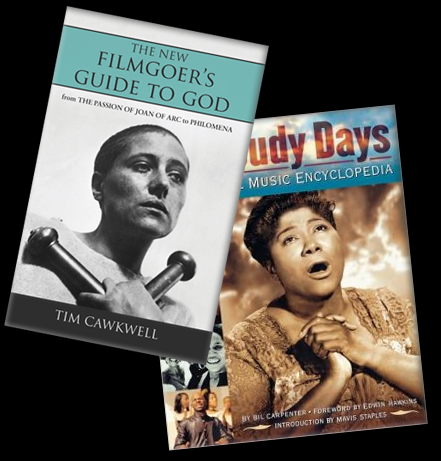 Tim Cawkwell is one of a` small number of excellent British writers on film, and indeed from a Christian perspective, who have put their thoughts down in book form. Two other names who come quickly to mind are Jeremy Clarke (often occupying space in Third Way) and Clive Marsh, a University lecturer. Cawkwell’s latest has the sub-heading on the front cover puts it, this text runs from The Passion of Joan of Arc to Philomena. Stephen Brown, film critic for The Church Times says Cawkwell throws down a tantalising gauntlet to those who refuse to believe there is a spiritual dimension in film. Brown points out that in this book Cawkwell goes beyond those well-documented religious explorations of certain major film directors. And so the writer is concerned to look at the work of Terence Davies, Michael Haneke and Pedro Almdovar. Excellent stuff! While mentioning film, it’s worthwhile giving a notice to The Celluloid Madonna –from Scripture to Screen, by Catherine 0’Brien, (Wallflower). This takes the reader through films that have featured or claim to be about Mary, the Mother of Jesus. THE HISTORY OF ROCK ‘N’ ROLL IN TEN SONGS (Yale University Press). In the world of rock music writers and commentators the American Greil Marcus can claim a place at the top table.. He’s been analysing the popular music scene for some time, and perhaps this has something to do with the fact that in his book The History of Rock ‘N’ Roll in Ten Songs (Yale University Press) six of the chosen titles take the reader back to either early 1960s or the 1950s. The book even opens with a lengthy quote from 1959 - Eating People Is Wrong from Malcolm Bradbury. Choosing such a book project seems a pretty dangerous state of things. Can the history of popular music be narrowed down to ten? even if by some quirk of things Marcus thought of The Ten Commandments., and surmised ‘ten’ has a time-honoured privileged state in a history of numbers! Running his ten titles around a few musicos gained only a small grunt of approval. The only title to correspond with the Marcus listing was ‘To Know Him Is To Love Him,’ and I chose that, and did so because it seemed to capture the fragility of teen relationships from the 1950s with their vulnerability and unease in a time when there were so many taboos. It did what the best of early ‘pop’ did – it made people feel it was their song because it touched them where it mattered in their one life. Good songs stand fresh interpretation in the social mix of another time, and , indeed, yes, the Teddy Bears associated hit was given a moving treatment by the late Amy Winehouse in 2006, but that wonderful artist made it her own, and five decades or so from the original, she sang how it felt to talk the talk about those time-honoured themes of love, fascination, commitment.